COWAL: A belated report of a female Blackcap at a feeder in Hunters Quay on 9th Feb from Callum Satchel. TIREE: An adult and 2x 3CY Glaucous Gulls at The Reef, adult Glaucous Gull at Salum and a 3CY Iceland Gull at Gott Bay (John Bowler). 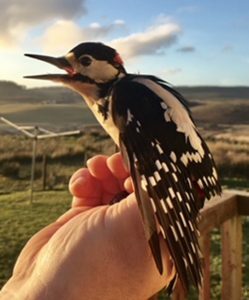 KINTYRE: Neil Brown caught a Great Spotted Woodpecker and first one he has ringed at the feeding station nr Campbeltown. 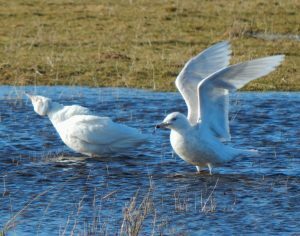 3CY Glaucous Gulls -The Reef, Tiree 21st Feb (John Bowler). Great Spotted Woodpecker- Kintyre 21st Feb (Neil Brown).